Building Soil N during the Transition Period: Is More Green Manure Best? In our region where manure is hard to find, legumes are necessary to build soil fertility in organic production. But water can be scarce and the lack of moisture make it challenging to use cover crops (planting a legume then go into a small grain the same year) or intercropping (planting a legume between the wheat rows for example, and take out the legume later in the season). Ideally, the first crop that is certifiable organic should have the best yield potential to reap the benefits of the organic price premium. One way to achieve good levels of soil nitrogen on that first certified year is to make sure to build it up during the transition period. Using legumes plowed into the soil instead of being harvested, or “green manure” is an efficient way to achieve that. So is it preferable to maximize legumes on the transition period? Are three years under green manure better than two or one? 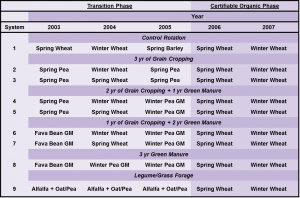 Kristy Borelli and other researchers compared different transition phase rotations: out of 9 different systems, two included 3 years of grain, two included two years of grain followed by one year of green manure, two included one year of grain followed by two years of green manure and one included three straight years of green manure. At the end of the transition period, the researchers compared the total gain in nitrogen: it was higher for any rotation that had at least one year of green manure. Three years of green manure resulted in slightly higher levels of N than rotations with only one or two years of green manure. More importantly, spring wheat in the first certified organic year was higher after three years of green manure than after one or two; but winter wheat yield on the second year of the certified organic phase was no different whether the transition had had one, two or three years of green manure. Protein levels in spring or winter wheat were the highest in any rotation than had had one, two or three years of green manure. Bottom line: successive years of green manure in the rotation to transition to organic are likely not necessary. 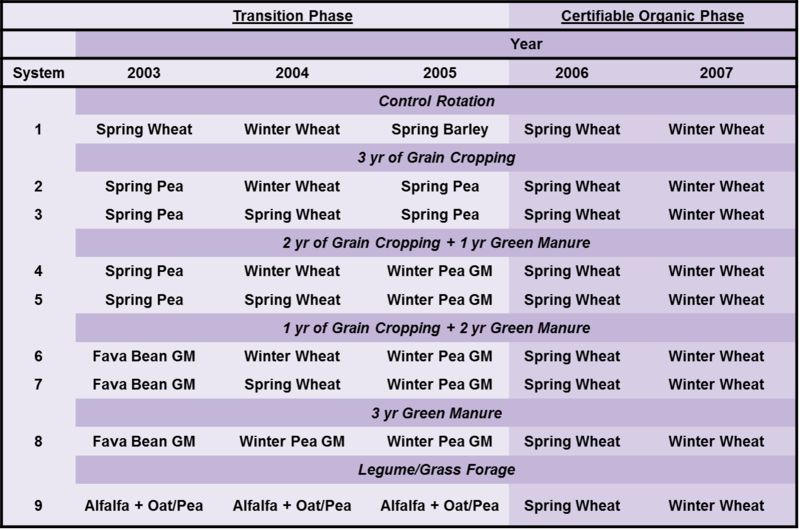 A transition phase rotation should plan on a green manure legume for at least its last year: rotations that only had small grain translated in lower soil N levels, lower yields and lower protein content in the certified organic phase. To go further: read more about this study here and here.